In clear translation the legends say ASPER, MOLDAVIA'S PRINCELY MINT and MOLDAVIA'S FATHER. 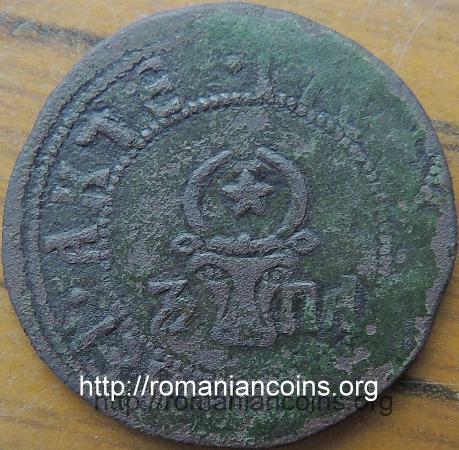 Although the inscription includes undeniable Slavonic content, the coin is considered to be the first Romanian coin featuring Romanian legend. 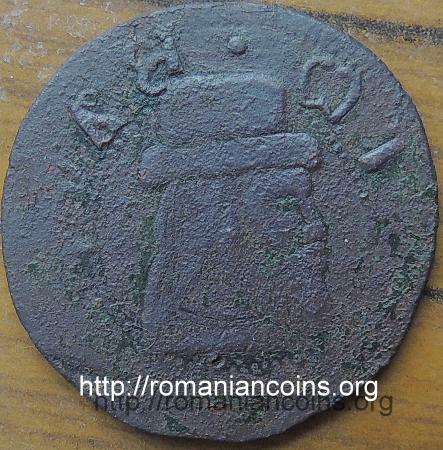 The images of the first Moldavian medieval coin on the page were made available for Romanian coins through the kind permission and contribution of Mr Adrian Popovici. The coin was struck in the year 7081 since world's creation (Anno Mundi) - as stated on the coin -, that is year 1573 after Christ. Cyrillic letters - and there are quite many of them, actually - have (almost every single one) a numerical correspondent. Digits from 1 to 9 are represented, then tens and hundreds, all following alphabetic order. For instance, for numbers 1, 2, 3, 4 and 5 letters A, V, G, D and E were used, similarly to the ancient Greek system, used also on the coins to mark the denomination value. Using Cyrillic letters, year 7081 is written ZPA. Z (looking like a 3, nearly) means 7, P is 80 and A is 1. No digit was used to denote the hundreds, because the number did not feature any. Z being placed before P and A, that means it refers to thousands. So, the result ZPA is not just 781, because 781 would have used a letter signifying itself 700. To tell them apart from letters, Cyrillic digits had a bar over them, eventually points before and after (or something like that, anyway). It must be mentioned that in the times of John the Frightful both religious and civil year began on 1st of September, the very day when the World was created. The akce is a coin equivalent to an asper, a piece of small value. The coin of John Vodă (Voivod) is reminded by chronicler Miron Costin, inside De neamul moldovenilor (On Moldavians' Strain) - although he could not tell which prince had struck it - inside chapter fifth where fortresses in Moldavia are reviewed: And the coin was found lower of Roman, at the dilapidation of a fortress, of that coin as the four ban Polish şestacs [sixers] and thicker yet, of red bronze and prince's face under German hat and Serbian letters around: "otetz Moldavskii": "Moldavia's father"; and in other place says hereghia [mint] of Moldavia. Here hereghia in Latin is called : hereditas, meaning patrimony. 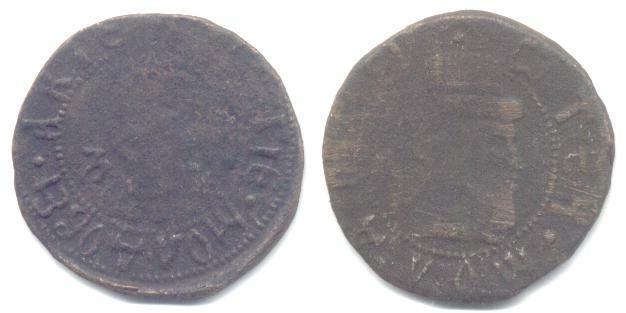 The word şestac met in the chronicle, which we translated by sixer is derived from the Romanian cardinal numer "şase" meaning six; it originated as word, most likely, in the intended similarity to Polish 6 groat (6 groszy or "szostak") coin, having about the same diameter as the asper of John Voivod the Frightful. The Polish coins are commonly found on the internet also under the name of 6 groschen. Ion Vodă cel Cumplit - John Voivod the Frightful, was such called because mainly of the way he started his reign in 1572. He ordered the deaths of many people through terrible pain and torments for the sake of the their hidden treasures, laymen and clergymen all the same. Priest and monks were burnt or buried alive and thrown into jail. The metropolitan Theofan himself fled. Chronicler Gheorghe Ureche wrote "he laughed of religion", and he even got married during the Christmass's fast. He was also called John Voivod the Armenian. Prince and scholar Dimitrie Cantemir (1710 - 1711) gives an explanation of this cognomen as being because of his custom to eat meat during the fasting of the holy apostles Peter and Paul. As Orthodox people the Romanians fasted, abstaining from meat especially, on every common Wendnesdays and Fridays in sign of respect and mourn for the passions of Christ and also during four large periods of the year, a custom that many religious people still keep today. Although rightfully belonging to the Orthodox branch of Christianity, the Armenians slightly stranded away from the mainstream along Egyptians and Ethiopians in the fifth century A.D. so that certain differences do exist. The cognomen cel Viteaz - the Brave - (resulting in John Voivod the Brave, see stamp) is to be considered a later creation of the communist era, intending to tip the scale toward his undisputed bravery and also to mild down the frightful and terrible nature of his character. John Voivod the Frightful (also known as the Armenian or even the Brave) was son of prince Ştefăniţă, grandson of Bogdan III (the Blind) and grand grandson of Stephen the Great and the Holy. His reign lasted shortly since 1572 over to 1574, and the coin pictured is sadly his only issue (having a few variants). In February 1574 the Turks demanded for the yearly tribute to be doubled. Searching for counselling with his boyars (noblemen), the prince decided to defend Moldavian rights with the arms. 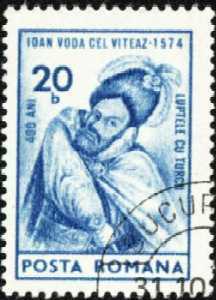 In April 1574 John Voivod defeated at Jilişte (the county of Vrancea today) the Turkish and Walachian (Muntenian) armies that were bringing pretender and prince to be Petru Şchiopul on the throne of Moldavia. As result of the victorious battle Moldavian armies reached Bucharest and brought Vintilă on the throne of Walachia. Other armies burned Brăila (Ottoman stronghold in Walachia), Tighina and Cetatea Albă (Ottoman strongholds in Moldavia), without seizing the fortresses though. On 10th of July a decisive confrontation took place, the battle at lake Cahul in southern Moldavia. A body of soldiers attempted to capture Turks to gather military inteligence, without success. Asked by his men how many Turks had been, John Voivod is known to have said "We shall count them during battle". Right before the fight started, hetman Eremia along the entire cavalry fled and joined the sultan's army. After a fierce battle, the superiority in number and weaponry of the Ottomans was plainly demonstrated and the Moldavians were forced to retreat to Roşcani, were they set a carriage camp fortified with trenches. On June 14th the surrender occured, forced by water shortage and a fatal shower that moistened the Moldavian gunpwder. Tricked by the Turks that ignored all the provisions agreed upon, John Voivod the Frightful was eventually beheaded, his lifeless body being tied to four camels and torn asunder. Hopeless, his army launched a suicide attack on the Turkish camp. Only thirteen Cossacks are known to have survived the massacre of the former army of over thirty hundred men powered with one hundred and ten cannons, inasmuch as the Moldavian traitors had been sent by the Turks to fight in the first line and so put to death by their own.